Sarah Wood has been awarded an honorary doctorate in recognition of her outstanding entrepreneurial leadership and her commitment to furthering education in technology. Dr Sarah Wood has been awarded an honorary doctorate in recognition of her outstanding entrepreneurial leadership and her commitment to furthering education in technology. 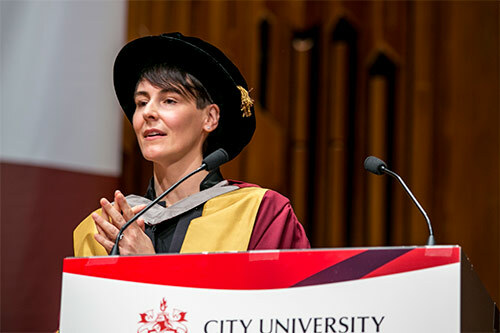 She received the Doctor of Science honoris causa from the University’s Vice-Chancellor, Professor Sir Paul Curran, at the graduation ceremony for Cass Business School. Sarah is co-founder and co-CEO of Unruly – the ad tech company that helps brands get their videos watched, tracked and shared online. Sarah co-founded Unruly in January 2006 alongside her partners Scott Button and Matthew Cooke and since then Unruly has grown to become a company with more than 200 staff across 15 international offices. Famous campaigns include Dove’s 'Real Beauty Sketches' – the most viewed online video ad of all time – Evian's Roller Babies and T-Mobile’s 'Life’s For Sharing'. Such success has not gone unnoticed and last September Unruly was acquired by NewsCorp for £114 million. Dr Sarah Wood said, "Cass Business School, City University London is a pioneer in marketing research and a valuable partner of London's thriving tech ecosystem. The pop-up university held in the Unruly clubhouse is a ground-breaking example of academia helping to support the next generation of entrepreneurs, a mission reinforced by the presence of The Hangout incubator within our HQ. "It's been an inspirational and hugely enjoyable experience to partner with the team at City University London. I really hope that our long-standing collaboration continues and can serve as a blueprint for academia and business as we seek to encourage entrepreneurial ambition and equip the next generation with the entrepreneurial mind-set and digital skills required for a post-industrial, rapidly changing economy."